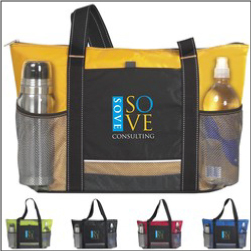 Order custom Imprinted Cooler Tote Bags that make great gift or trade show giveaways. These cooler totes feature additional pockets for water bottles and can hold up to 24 cans. Great on the golf course, at sports events and games, picnics, events, hiking, and more. Great for keeping cold groceries in a vehicle. Popular with school teams and booster fundraising. Approx. 15w x 13.5h x 6d.